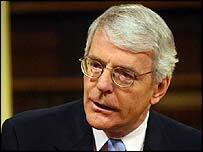 John Major has denied trying to block the release of papers on 1992's "Black Wednesday", when Britain crashed out of the Exchange Rate Mechanism (ERM). The former prime minister told BBC News he and former chancellor Norman Lamont had been the victims of "whispering voices" to the press. The Times reported the publication, under the Freedom of Information Act, had been delayed at their request. Downing Street says the matter was dealt with by officials, not ministers. Ministers did not look at papers relating to a previous government before publication, the prime minister's spokesman said on Friday. Who spread the stories that we were blocking publication and why? And a Treasury spokesman has said no one was trying to block the release of the papers. But Mr Major said he thought the whole thing had been "a fairly rum affair". The papers were reportedly due to be published on Tuesday, but were delayed to give him and Lord Lamont time to look at them. Mr Major was in the US when he was informed of the request for the documents on Wednesday. Speaking on BBC Radio 4's Today programme, he said: "I do think some important questions arise from this. "Firstly why were we not told for a month after the request that the documents be made available had been made? I think we should have been. "Secondly, who spread the stories that we were blocking publication and why? "And why did some of the press print what they had been told categorically by a former prime minister and a former chancellor and the Treasury was untrue?" Later Lord Lamont told Channel 4 News he believed the stories were a "combination of journalists getting it wrong, and being prompted by people within the Treasury - Labour political advisers." But a Labour spokesman denied any party officials had suggested there had been an attempt to block the publication. He said the first anyone at the party's headquarters knew about the Black Wednesday request was when they read about it in the newspapers. "But we see nothing wrong whatsoever in probing the Tory decision that delivered economic calamity to our country," he added. More than 200 pages of documents are to be published on the events leading to Black Wednesday - 16 September 1992 - one of the most memorable failures of post-war British economic policy. Leaving the ERM, a system for tying the value of the pound to that of other European currencies, damaged the Conservatives' reputation for economic competence. The government says all papers will be published, but the timing is up to civil servants, not the government. And it says it is acting on "long established conventions, based on fairness and impartiality" in consulting Mr Major and Lord Lamont about it. All parties are gearing up for the general election - widely expected to be called for May.